Password recovery tool for Act! (supports all versions through Act! 2008). MBOX to PST Converter performs conversion and migration of MBOX files precisely. Setup software program rapidly and easy. SoftEmpire is happy to introduce a big variety of the best free programs, tools, and applications. On this catalog you can setup demo versions of popular marketable programs, and try the most excellent free programs for your laptop or cellular device. Search an ultimate set of the best recent software programs on our catalogue! Recieve demo editions and try new apps on the notebook or mobile gadget. Have a look on the latest editions and updates of common tool, last programs, and notebook programs! Get now! Computer utility software downloads. The excellent programs for Windows, Linux, and Mac! System software planned to help explore, configure, optimise, and maintain the computer. Hard disk utility software to determine the situation and manage all types of disk drives. Windows utility software tool accumulation to value, organize, and improve the activities of the computer. Password revealer software recovers all lost or forgotten internet explorer and Windows application saved passwords. Password rescue software is useful both for system administrator and general users. Internet explorer password recovery utility restores passwords for various types of accounts like Newsgroup accounts, online shopping, billing address etc. 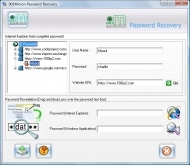 This password recovery software is easy to use with graphical user interface that easily unmasks lost passwords of any length and complexity within seconds. Enhanced graphical user interface helps both technical as well as non technical users to use the utility without any difficulty. Password recovery utility also recovers passwords for various Windows applications like Zip files. The email services supported by this password restore software are Gmail, Yahoo mail, Rediffmail, Hotmail, Zapak mail etc. IE password regain software supports all version of internet explorer. Utility works on all Windows platform like Windows Vista, Windows XP, Windows 2000, Windows 2003, Windows NT, Windows ME, Windows 98 etc. * Retrieves all internet explorer saved passwords including FTP passwords, IE auto form and auto complete fields, Auto complete passwords. * All versions of MS internet explorer are supported. * Software is provided with an easy to use graphical user interface. * Retrieve password is saved at user specified location in text file format. * Supports multilingual password recovery. * Support email services like Gmail, Yahoo mail, Rediffmail, Hotmail, Zapak mail etc. *Works on all versions of Windows operating systems such as Windows Vista, XP, 2000, 2003, NT, ME, 98. If you're looking for cutting-edge technology that will speed up your computer with a thorough analysis and repair of your registry for good, look no further. RegistryBot can repair your PC problems in just minutes.